The almost $650,000 that Columbia has spent to update the facades of over 24 businesses in the North Main area during the past three years has meant more business for owners like Mark Sills of Angelo’s Zesto and a more livable neighborhood. Take a walk along North Main Street toward Columbia’s Eau Claire area, past Hyatt Park on the left and Bi-Lo on the right, then veer right a little, and you’ll see some changes at Angelo’s Zesto. Angelo’s Zesto owner Mark Sills says the city’s facade improvement program help fund $500,000 in renovations that were a long time coming, including a repaved parking lot and new outdoor seating and landscaping. He’s paying for much of the project, which includes a new kitchen and front entrance, and expects it to be done in February. The building sports a new roof, the parking lot is repaved and there’s new outdoor seating amid a fresh green lawn and potted plants – renovations made possible in part by the city’s facade improvement program. Owner Mark Sills said he’d wanted to make improvements to the iconic 57‑year-old fast-food restaurant for almost eight years. While he paid for most of the approximately $500,000 himself, he also used an $8,000 loan from Columbia’s facade improvement program. Sills, who began working at Angelo’s Zesto at 13 and then bought it at 26, said the facade improvement program is a good change for North Main. “I’m glad the city’s putting money back into the area,” Sills said. The facade program grew out of input from the North Columbia Business Association and a 2008 study that said the 4 miles along North Main, from Scott to Carteret streets, wasn’t getting customers to come back because it was run-down. Since 2012, Columbia has spent almost $650,000 improving the look of about two dozen businesses in the North Main area. Businesses could get a low-interest loan of up to $15,000, with 80 percent of the project cost covered by the city. Sweet Temptations Bakery manager Kristi Wilson is excited about the bakery’s storefront improvements, like these new signs, which she hopes will draw in new customers. A property owner must be in the program’s target area, and improvements are limited to exteriors, said Gerry Lynn Hall, the program’s director. The idea is that better‑looking buildings help improve an area’s economy, she said. “The more you have businesses, and neighborhood friendly businesses, and more people going in and out, there’s less opportunity for crime,” Hall said. Sills said that when facade program signs starting popping up, and when word got out in the newspaper about the program, he noticed and applied. “It’s good for the area, it’s good for us, and good for the city to offer all of this to help the area kind of come up to speed,” Sills said. A few blocks away, Sweet Temptations Bakery is doing $50,000 in renovations also partially funded through the facade program. At the bakery, which moved to the area four years ago from a home in Hopkins where it was founded, sleek new signs have replaced a nondescript building with no signs at all, and freshly stained wood doors have replaced old metal framed ones that used to be the first thing customers saw. 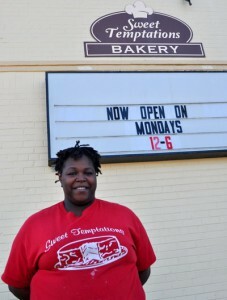 Watch Sweet Temptations manager Kristi Wilson discuss the bakery’s reasons for participating in the program. This map will give you a better understanding of the impact the facade program made. The bakery was looking to improve business, said Kristi Wilson, a manager, but probably could not afford the changes without the city’s program. She said that as a family-run business, it’s important to be an inviting and open place that can bring people together, and now the outside is cohesive and memorable. Improving facades is similar to the broken-window theory proposed by sociologists in the 1980s: Broken windows are signs of neglect and can be an early sign that an area is deteriorating, leading to more crime. Facades are important because nicely designed, attractive and well-kept city centers attract tourists and young people, Columbia-based urban design planner Lucinda Statler said. “It’s becoming increasingly more important to make sure for a city’s healthy economy that we have an attractive and safe urban center,” she said. 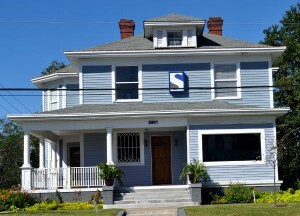 The Solomon Law Group renovated this North Main Street house, which Hyatt Park-Keenan Terrace Neighborhood Association President Michael Hill cites as an excellent example of a well-kept business in the area. But there’s still room for improvement outside of the city’s program, said Michael Hill, president of the Hyatt Park-Keenan Terrace Neighborhood Association, as he pointed to a building on North Main with paper and wooden boards covering the windows. Because it’s a complaint-based system, Hill encourages community members to tell local officials if they see codes not being enforced. Because government can’t just go in and tear down a building or facade unless it becomes a safety issue or doesn’t meet code, subsidized improvement programs can be a good option, Statler said. Two Notch Road is the next area to get the program’s focus, and perhaps at some point West Beltline, Hall said.